Over 20% of the population in Horry County lives with no health insurance, including the unemployed and those who are employed, but have no health coverage. Many live in rural areas and have no transportation or access to healthcare services. The current economic outlook makes their needs even more urgent. Most individuals screened through the Healthreach program have no medical insurance and no family physician. Their medical care is obtained in the hospital emergency room. Through these screenings, we hope to discover their medical problems and educate them on proper treatment to remain healthy and active. Screenings and education for the under-served and indigent population free of charge. CMC Smart Snacks Program, a food and nutrition program for children in the Horry County School District. Elementary aged children in need at Waccamaw Elementary, Homewood Elementary, Midland Elementary, and Conway Elementary receive nutritious snacks every weekend during the school year. 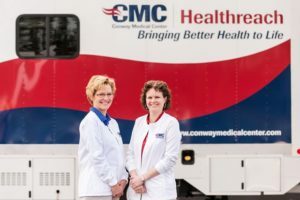 The CMC Mammography Initiative, which provides free mammograms for individuals ages 40-47 who are uninsured and do not qualify for government assistance. Colon Cancer Screening Initiative, a program providing colonoscopies for those in need, all referrals come from Friendship Medical Clinic. Please consider donating to the Healthreach initiative and supporting any of these programs! Healthreach is proud to have the support of our Corporate Partner, Conway National Bank. Community Education Classes: CPR, Quit Smart Smoking Cessation, and Safe Sitter. CLICK HERE to view a calendar of monthly Healthreach Van locations and other community education opportunities.